Get out the markers and glitter, this little gingerbread man is just waiting to be decorated and colored! Your child will have fun getting creative with this greeting card template. When he's done, just fold into quarters and you'll have a cute Christmas card. You can even make your own envelopes! To see how, Click here. 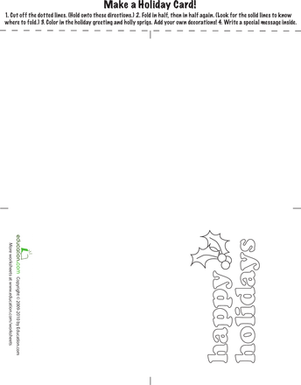 With this printable, your child will make a holiday card to send to someone special. A fun afternoon arts and crafts activity. 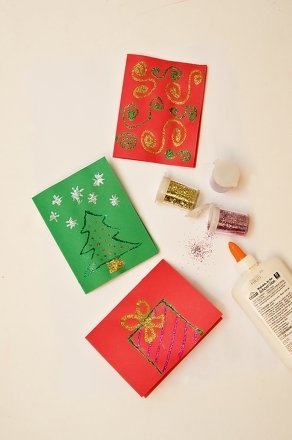 Your child will love helping you print out this fun and colorful holiday card. Encourage him to write a note inside to give him little writing practise. 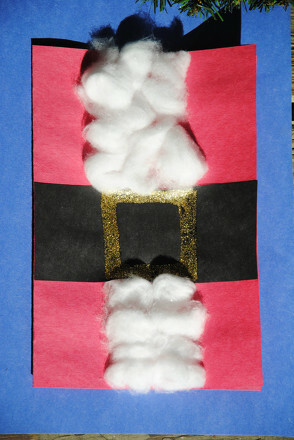 Here is a great holiday activity for you and your little one. He can practise his handwriting and writing addresses for these home-made Christmas cards.